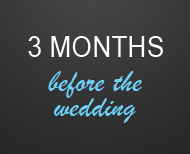 We recommend that everyone is measured at least three months before the wedding. This time might vary according to your wedding party's particular needs. Our associates can discuss this with you during your registration. 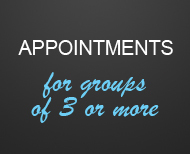 Appointments are not required for fittings. However, they are preferred for groups of three or more. If you can schedule some time during the day or early in the week, we are generally less busy during these times. The later part of the week (Thursday - Friday) is usually busier with pick ups. How long will it take for the fitting? 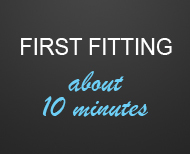 It takes about 10 minutes for the first fitting. It simply involves a few measurements, and possibly a couple try-ons. We recommend not wearing heavy clothing such as sweatshirts or multiple shirts. If you must wear several layers, it is very helpful to have a t-shirt on underneath so you can take them off for some of the measurements. If you are wearing sandals, please bring a pair of dress socks for your shoe try-on. What measurements are we taking? 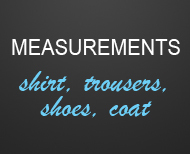 Neck and sleeve measurements are taken for the shirt size, waist and out-seam measurements for the trouser size, and chest and overarm measurements to determine a coat size. We also ask for height and weight, and tuxedo shoes are tried on for size. These measurements are not always a guarantee that everything will fit properly; they are guidelines to choose the best sizes for you to try on at your "final" fitting. 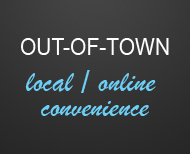 or mailed, faxed, or called into the store where the tuxedo will be picked up. Click here to print off a measurement form. What is a "final" fitting? 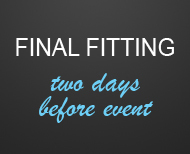 The "final" fitting is usually one or two days prior to the event date. This is when you try on the tuxedo that was assembled for you based on your measurements. 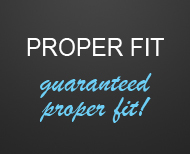 If any changes or alterations are necessary, we can take care of it at this time so that you qualify for our Proper Fit Program. What is the Proper Fit Program? This is a program set up to guarantee a proper fit to all of our customers. After trying on your tuxedo at pick up and allowing us to make the final approval, you are guaranteed a proper fit. This means that if anything goes wrong from here, DuBois will gladly take full responsibility and make it right at DuBois' expense.